I woke up realizing that I had not scheduled a post for today. I’ve been doing that so often that sometimes I forget that I’m supposed to be posting. I haven’t been doing much cooking lately so there’s no Strange But Good to post about. When I realized I had not written a post, the post that started to formulate in my brain was full of complaints. It’s too hot (it’s only 76 degrees in Silver City…why are we in New Jersey?) We’ve had too much rain. Everything is damp from the humidity. My poor air conditioner can’t compensate for these temperatures much longer. I hate when I complain like that, and didn’t really want to, but it’s all been aggravating me so what the heck. Then something came to me. If you’ve been reading BCDC lately, you know I’m going through a purge. Sorting and packing and cleaning out in an effort to sell this house and get to New Mexico. I’ve been talking about the things I’ve found and the things I’ve chosen to give up as well as the trash I’ve been putting out. Today is trash day and I’ve done very well, I might add. But I thought I’d talk about a cool thing that I found in the basement. I don’t know where it came from. Was it mine or was it something left in the basement by Gram and Pop? I think it’s something they left. I should have taken a before picture, but I didn’t really expect the after to work out so well. 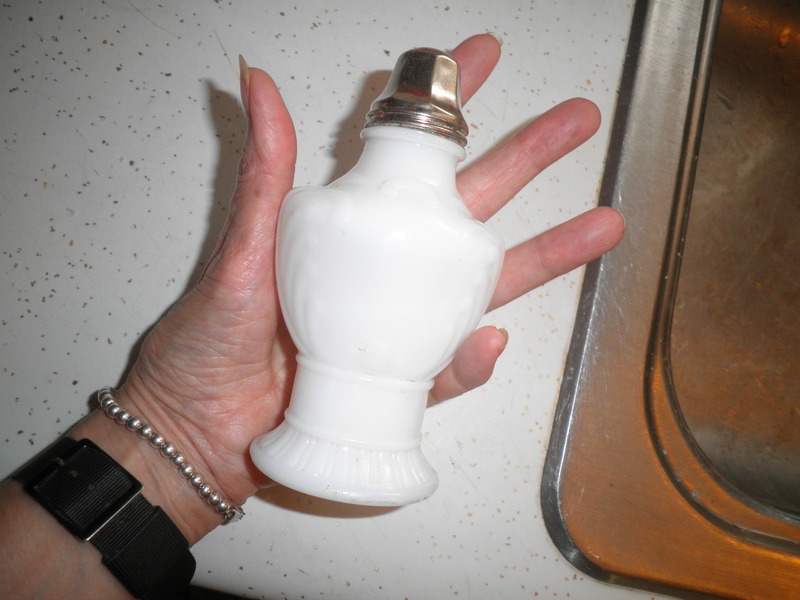 The before would have shown a completely dirty and grimy milk glass ( I think) bottle with a dreadfully corroded top. A day’s soaking took care of the bottle. I took a tooth-brush to it and got the dirt out of all the crevices. The top was another story. I was pretty sure it was unsalvagable. I soaked it and it looked the same. I used Soft Scrub and a tooth-brush and that barely touched the corrosion. Then I thought…I have jewelry cleaner! I let it soak for probably not even 2 minutes and it came up shiny and bright. I was so excited! I’m not sure what it was intended to be. I actually think it’s a barber shop bottle that probably was used for talc or something like that. I’m not sure what I’m going to use it for. I was thinking of maybe putting cinnamon in it to keep on the table. Regardless, I’ve decided it’s staying because it’s pretty and can actually be useful. I’m just amazed that it worked out so well. My projects continue and I’ll be updating more throughout the week. I’m pretty excited at the moment. I could complain, but why bother! I decided this works as a Snapshot Saturday post even though it wasn’t originally intended that way. Please check out the other photographers on West Metro Mommy. Besides, I hate to miss out on Snapshot Saturday! Thanks, Jenn, I was excited to find it. Thanks, Bob, I love them too. Found some more yesterday. Trying to stay cool. It’s only 76 degrees in NM!! it’s like your diamond in the rough for the day! glad you found something happy out of all your frustrations. it’s been that kind of week. so the weekend is here with perfect timing! Yes,Yes, My dear! Found some more goodies yesterday. I keep working and keep being rewarded with little treasures. Fran, It’s very pretty – hope you kept it after making it so pretty. Diane, I think I’ve decided to keep it. It’s very cool. Thanks for visiting! I do love old bottles…I once had a few in a collection, but, like many of my collections, the “purge” won out. Enjoy! Thanks, Laurel. Trusty me, I’m not starting a collection! 😉 I just thought this was so pretty. Thanks for visiting! How cool it is that you started with nothing this morning and everything worked together to create this lovely post! Here’s my Saturday Snapshot, a visit to Blue Willow Books to hear children’s picture book author and illustrator, John Rocco. Thanks, Deb, glad you like it! Thanks for visiting. We downsized last year and moved to a condo so we could spend more time travelling. But now I find myself buying new stuff to decorate. Jackie, that’s my worry when we get to our new house in NM. That’s why I’m trying to get rid of as much as I can being as unsentimental as possible. As far as furniture, there are really only a few pieces I want to keep and those have real sentimental value. Thanks for visiting! Love treasure finds like that… and possible memories attached! Thanks, Sheila! If I only knew for sure where it came from I could write a story about it! Or maybe I should just make it up. Thanks for stopping by. What an exciting find, good luck with your projects. Thanks, Irene…I keep working at it! Thanks for stopping by. Older objects have such lovely lines and designs, well done for resuscitating this family heirloom. Thanks, Louise, I was so happy when it cleaned up so well. Thanks for stopping by! Whatever it is….it looks brand new now! Thanks, Melinda. Since it has holes in the top, which I don’t think you could see from the photo, I think I’ll use it for cinnamon. Thanks for visiting! It’s gorgeous! If the top had holes in it, I’d guess it’s a sugar shaker. Thanks, Kathy! It does have holes in the top, couldn’t tell that from my photo (duh…) So I think it will hold cinnamon to shake on Everything! Thanks for stopping by! Thanks, Paulita! I’m working hard and plan to continue. Thanks for visiting! Thanks, Angel, I really appreciate it! I don’t usually participate in the award forwardings. Sorry but I do appreciate the thought! What a pretty bottle. It always feels good when you make something new again and get some use out of it. Happy Sunday Fran. Stacie, I really wish I’d done a before photo. I’m very happy with the result.